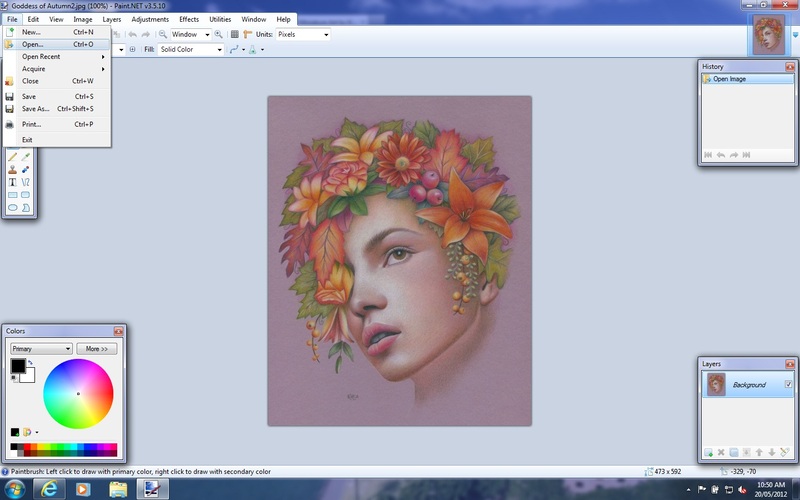 There are many different ways that you can place a watermark on your artwork or photo, but I thought I would share my method as it uses a wonderful photo editing software that you can download for free from the internet called Paint.net﻿. Although I do have the full version of Photoshop, I find this program quicker and easier to you use, so it is great for anyone who doesn't want the expense and complexity of Photoshop, but still wants to play around with their images. 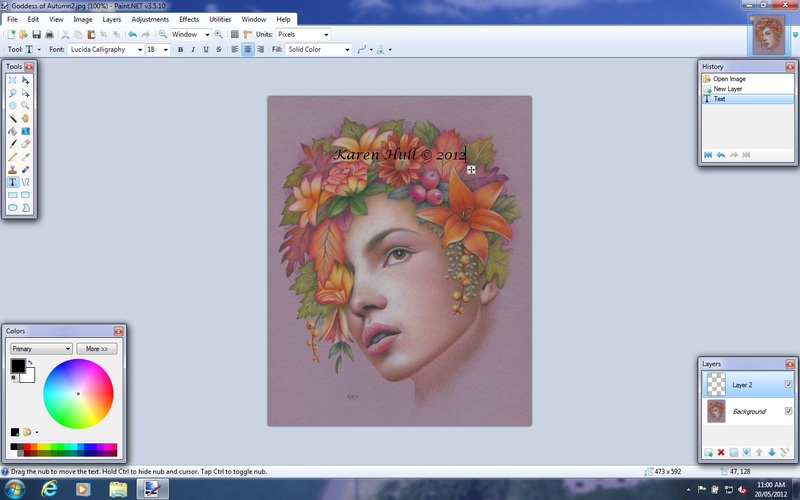 The first step is to open your image within your Paint.net program. In the Tools box on the left, click on the T for text. You will then see some tabs pop up at the top, which allow you to choose your font, font size and positioning for text. I always choose the same font for all my images (Lucida Calligraphy) and this will give your portfolio more uniformity. 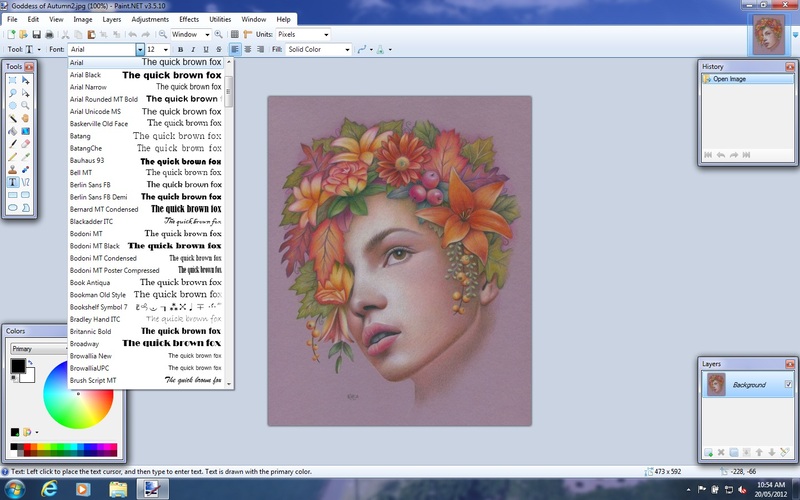 The size of the font will depend on the size of the image you are working on. You can then play around with the positioning of your watermark. I usually place it in the middle of the image, but away from major features. A little box will come up on your image that allow you to move your watermark around once you have typed it it. You can also see a colour selector box on the bottom left of the page. As a rule, I always use either black text for a lighter artwork, or white text for a darker artwork, and I then adjust the transparency so that the watermark is more subtle. However you can choose any colour font you desire from the colour selector. In this next image, you can see I have added in the text, and you can also see the little box which allows you to move your text around. To get a Copyright symbol, hold down the Alt button and press the numbers 0, 1, 6 and 9, in that order. The next step is to adjust the transparency of your watermark, so that it doesn't overwhelm your image. Click on Layers and then Layer properties and then adjust the slider across until you are happy with the transparency and then click on OK. The final step is to merge the layer down. If you don't do this, it will be saved as a PNG file in layers, rather than as a jpeg file. 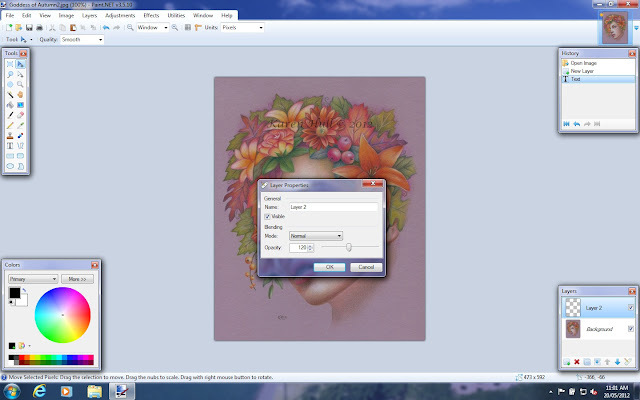 Click on Layers and then Merge layer down. The final and most important step is to Save As a new file. If you just click on Save, then your original image will be over ridden with an image with the watermark, so always click on Save As and give your file a new name. Be sure to check also that it is being saved as a jpeg and not a PNG file. Whenever I scan in a new artwork, I save it as the original size, then in a smaller size without a watermark, and also the smaller size with a watermark. 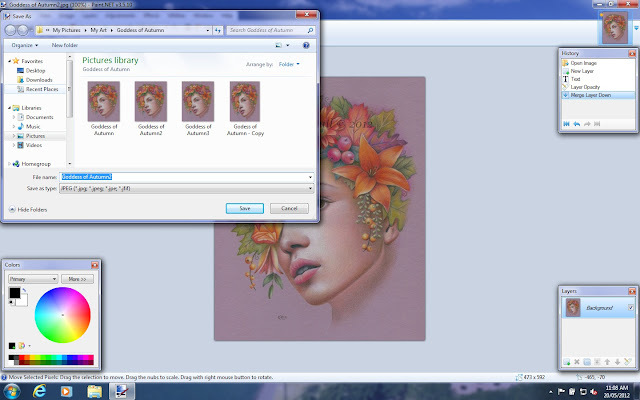 So, in most cases, for each of my artworks I have a folder with at least 3 copies of the image in different formats. I hope this brief tutorial gives you some helpful hints. Please don't hesitate to contact me if you have any questions. 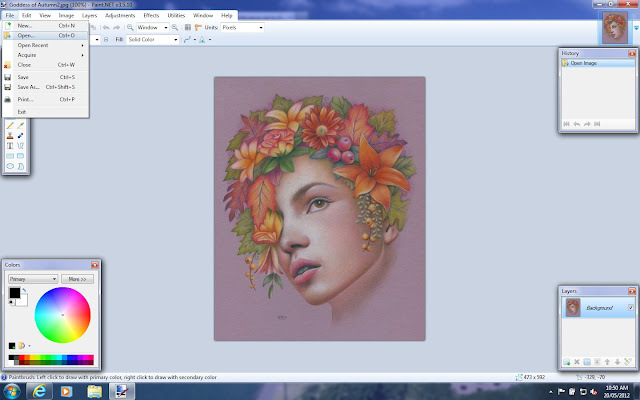 I too use Paint.Net for simplicity so will make sure I get back into 'good habits' and start using watermarks. Great little tutourial Karen, it is very important to get into the watermark habit. It is amazing where your art can end up. Learn to draw photo realistic artworks in coloured pencil and graphite with these comprehensive step by step tutorials by award winning artist Karen Hull. Ann Ranlett's Blog - Animals, Art, Etc.